My good friend Helen asked me to make two cakes for her daughter's birthday this year - one was a Qiaohu tiger cake for her preschool class, and then second was for her birthday party! For the second cake, she had a specific look in mind. She wanted a naked layer cake, and she wanted it to look like Momofuku Milk Bar's birthday cake, except with my own vanilla cake recipe, filled with fresh strawberries and whipped cream, and minus the birthday cake crumbles. So cute! For the funfetti cake I used the vanilla cake recipe in my book, The Hello Kitty Baking Book, and folded in 2/3 cup of rainbow sprinkles at the end. (I also sprinkled on a few on top before baking, for good measure). I made two batches of cake batter to give me four 8-inch cake layers, although I only ended up using three of the layers. I normally split my cake layers horizontally into two, but this time I wanted thicker layers - since it was going to be a naked cake and was not going to have frosting on the outside, I wanted the cake layers to really stand out. So I just cut the tops off of each layer, and then cut off the sides of the cake to expose the funfetti sprinkles inside. 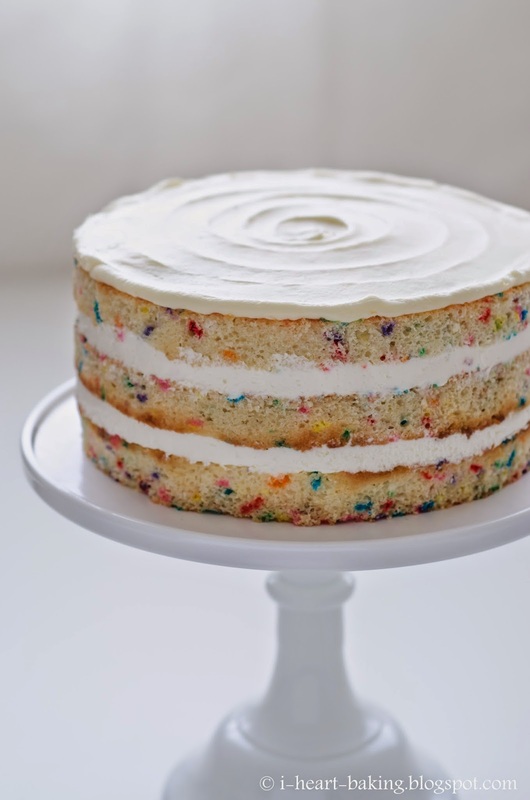 (Otherwise, you would just see brown cake layers with drippy funfetti - see this post to get an idea of what it looks like without the sides cut off). I filled each funfetti cake layer with a good dose of freshly whipped cream and sliced fresh strawberries, and then used an offset spatula to go around the cake and smooth out the filling layers. After I stacked and filled all three layers, I covered the top with cream cheese frosting, and used an offset spatula to create a rustic swirly design on the top of the cake. Since Helen was going to have 60 people at the party, I also baked up a second cake, this time covered in frosting and with the number "2" outlined in sprinkles. At the party, we added two long pink candles for the birthday girl to blow out. Hope you enjoyed your cake and cookies, sweet Marni! You are TOO CUTE! Wow this is a great post! 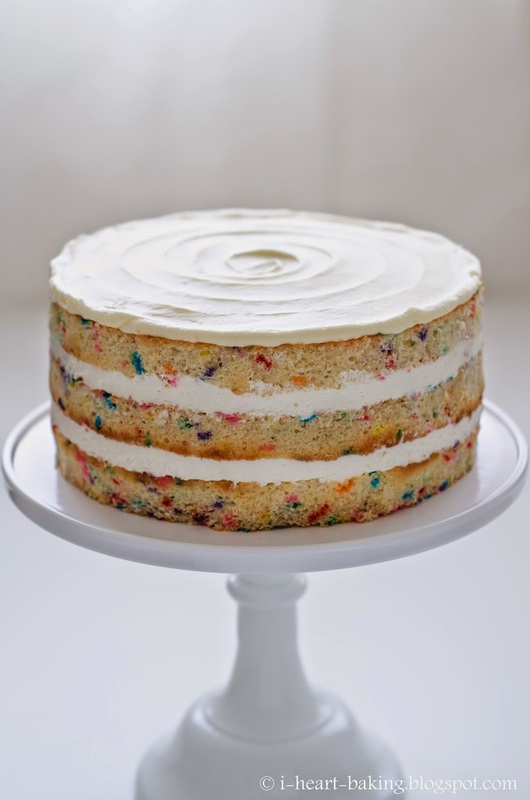 Funfetti cake is my favorite and yours are gorgeous! How did you make the #2? 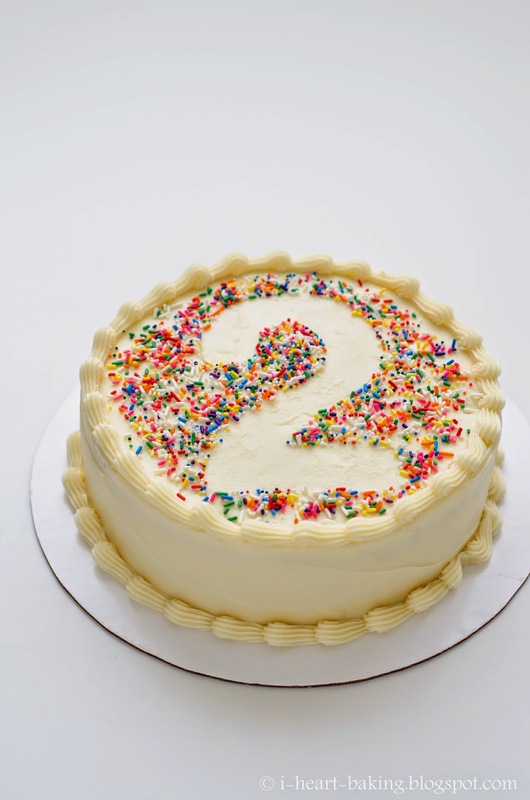 @Monique - i drew the number "2" on cardstock and cut it out, then placed it on the cake before adding the rainbow sprinkles. 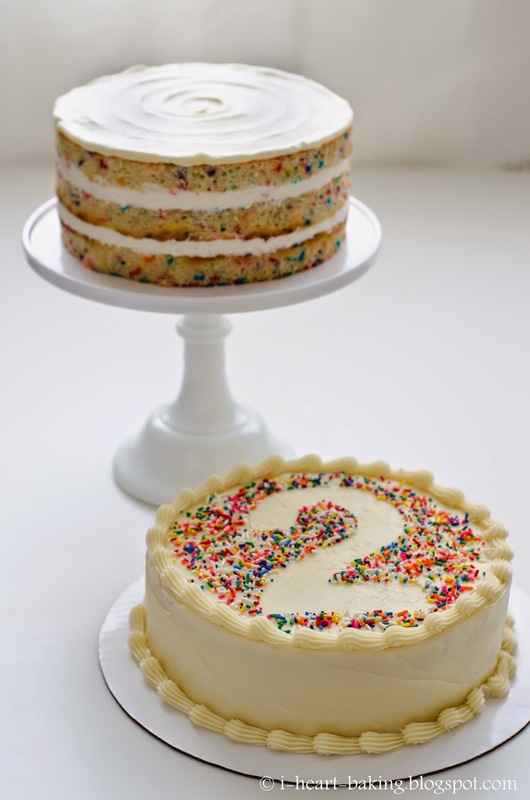 then take the cardstock off and you're left with the number "2" on the cake!